The Air Force has not officially announced what the standards will be, but an internal document obtained by Air Force Times shows what is planned. 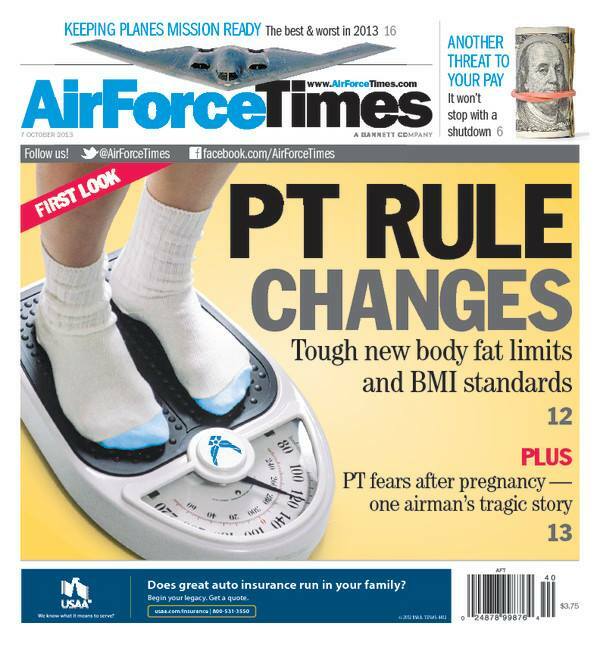 Also this week, airmen struggle to pass the PT test months after giving birth. Read how one airman was so convinced she would fail the test that she had someone stab her in the stomach to try to get out of taking it. Meanwhile, budget cuts and constant use from more than a decade of war have taken their toll on aircraft readiness. Read which planes are flying and which are spending most of their time on the ground. As U.S. and other NATO troops pull out of Afghanistan, more airmen are headed there to train the Afghan air force. Brig. Gen. John Michel, who leads the training efforts, talks to Air Force Times’ Kristin Davis about how long the mission will take. And the Air Force Academy’s collection of museum artifacts is in disarray. The Defense Department Inspector General’s office issued a stinging report on how historic objects have been mishandled or lost.